On this blog, we occasionally look at the charts of actors who repeatedly play roles that inhabit a particular ethical position. This applies indirectly to "Libertarian Astrology" in that ethics underlie political ideologies, and the charts of actors tend to reflect characteristics they regularly portray. I've seen up-and-coming young star Britt Robertson in two television shows now: "The Secret Circle" and "Under the Dome". In both, she plays an unwitting innocent who by circumstance finds herself in situations requiring ethical judgement calls. In both, she decides to depart from purely ethical behavior in order to survive. Even in the surprisingly depressing "Tomorrowland", she spends the length of the feature film seeking a shining city of hope, only to find upon arrival that it offers tyranny and (of course) an ethical conundrum. Pallas represents (among other things) ethics in the horoscope. See this blog and associated site for hundreds of examples. 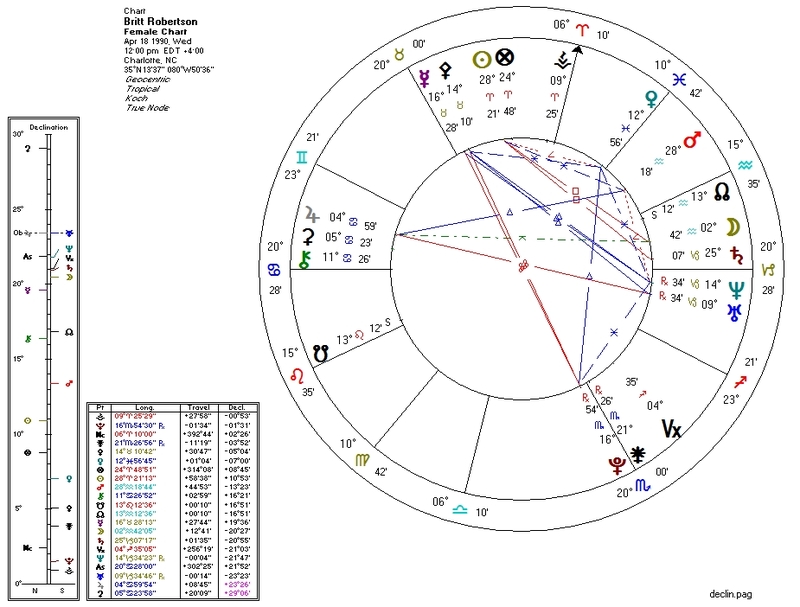 For Robertson, we would expect to see a mixed Pallas signature including "ethical" chart aspects (Pallas/ruler with Sun, Mercury, and/or North Node) and "unethical" chart aspects (Pallas/ruler with Pluto, South Node, and/or discordant aspect from Jupiter). Undetermined/Wildcard: Pallas square the Nodes, which are stationary. Ethics are very conflicted and very much a focal point of this horoscope. With the nodal square, the general tendency is to gain a stronger ethical consciousness with age, but this is not guaranteed. Should Robertson remain in the spotlight for a long time, it will be interesting to see if the ethical awareness of her roles shifts over time. Virtually all female celebrities have significant Pallas/Venus connections, perhaps suggesting "weaponized" (Pallas) charisma (Venus). Robertson has Pallas in Taurus, sextile Venus and trine Venus ruler Neptune. Robertson's comic-actress performance is actually the brightest thing about the recently released Disney dystopia "Tomorrowland". Liberal mega-star George Clooney, who is not a bad actor, here fails to convince that he's anyone other than liberal mega-star George Clooney. Perhaps this is deliberate given the film's very "progressive" message, but I prefer to see Clooney in his recurring roles as a smug con-man. "Tomorrowland" claims to be about the battle between hope and despair but undermines its own purported aims. "Despair" is repeatedly presented in the form of Anthropogenic Global Warming, arguably a government-sanctioned hoax (or at very least a conclusion that is still under debate). "Hope" is represented by images of pinwheel wind-farms, which have been known to kill bird populations, expend resources and provide little power in return, and actually cause warming. The villain in the film kills hope by instilling humanity with fear of destruction not actually guaranteed to come -- but the film itself does the same thing in real life! On top of this, the film simultaneously glorifies NASA, rockets, and space travel. These pursuits, while inspiring, can hardly be resource-efficient and "carbon neutral". "Tomorrowland" shoots itself repeatedly in its ideological foot. This "inconvenient truth" underscores a problem inherent in much fiction that carries sociopolitical messages. The problem is that the messages are often false and based on faulty understanding and/or false premises -- and/or that audiences take exaggerated fictional elements and interpret them as truth. Upton Sinclair's "The Jungle" comes to mind.